Screen Innovations is now shipping the Zero Edge FLEX projection screen that the company showed off at the CEDIA Expo back in September. Because of its flexible design, the Zero Edge FLEX is easy to break down and transport, even at its maximum screen size of 250 inches. Pricing starts at $1,998 for an 80-inch 16:9 screen. Screen Innovations (SI) is now shipping its new Zero Edge FLEX projection screen--the video industry's first award-winning projection screen that boasts a flexible form factor and a Zero Edge appearance. 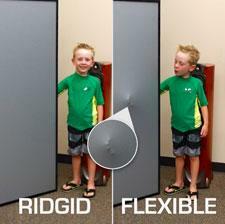 Zero Edge FLEX is a new, flexible projection screen that builds on the Zero Edge look made famous by SI. Available in sizes up to 250 inches diagonal, the Zero Edge FLEX is available in the ambient-light-rejecting Slate, acoustically transparent Maestro Weave, traditional Pure White and Pure Gray, and acoustically transparent Maestro Weave (coming soon) projection screens. Zero Edge FLEX easily breaks down into a compact, traditional fixed-frame box and assembles on-site, making it cost-effective to ship AND allowing integrators to navigate tight spaces, elevators, and stairways. The new design will dramatically cut down on freight damage and make international shipping hassle-free. Ryan Gustafson, president and founder of Screen Innovations said, "We developed this screen solution based on critical feedback from our worldwide dealer base, who wanted massive sizes as well as easy shipping and receiving. Our CES demonstration will showcase the powerful combination of our new award-winning ambient-light-rejection material, Slate, on the new Zero Edge Flex form factor." Screen Innovations makes it easy to choose the right screen for each application, based on lighting, room size, seating distance, and more. Visit www.screeninnovations.com to check out the Screen Calculator, Screen Wizard, and Projector Wizard online tools. • Screen Innovations Touts Flexibility at HomeTheaterReview.com. • Screen Innovations Zero Edge Pure White 1.3 Screen Reviewed at HomeTheaterReview.com.